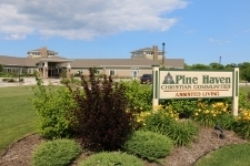 Located on the north side of Sheboygan Falls, Pine Haven Christian Communities' Haven Drive campus currently provides Supported Independent Living for seniors in our Prairie Crossing apartment building. Our Haven Avenue campus is located in Sheboygan Falls, just south of Highway 23 and west of Highway 32. Take Highway 32 south, then turn right onto Hamann Drive (just past Odyssey Lanes). At the end of Hamann Drive, you will turn left onto our private road, Haven Lane. This will take you directly to the main entrance of the Haven Drive campus. You can also reach the campus by taking County Road C west, then turning right (north) onto 6th Street, just before the Piggly Wiggly. Take the second left onto Pinehaven Lane. This will lead you to Haven Drive, on the right, which will take you to the main entrance to the campus. Or, just past Haven Drive is the main entrance to our Prairie Crossing building. To take a virtual tour of this campus, simply click on the image to the right, and you can "stroll" through the campus and see what we have to offer. Currently there is one building on this campus, known as our Prairie Crossing building, which houses 40 apartments for seniors. This building is licensed as a Residential Care Apartment Complex (RCAC), allowing residents to live independent lives, secure in the knowledge that help is on site, should it be needed. Each private apartment includes a private bathroom with shower, refrigerator/freezer, microwave, stove with oven, washer/dryer, and dishwasher (in most units). Electricity, heat, water, sewer, air-conditioning, telephone, basic cable, light housekeeping, and a meal plan of 3-meals per day are included. There are 14 rooms for rehabilitation stays. Rooms are 259-295 sq. ft. Each room has its own private, easily accessible bathroom with European-style shower. A state-of-the-art rehabilitation gym is planned for both in-patient and outpatient rehabilitation treatment. There are three Memory Care households on this campus: Covenant Home North, Covenant Home South, and Faith Home. Each Memory Care household is designed specifically for memory care with looping hallways, an interior courtyard garden, and secured entryways for safety. Full maps of the campus are available at the front desk - or you can print out this campus map for your reference.